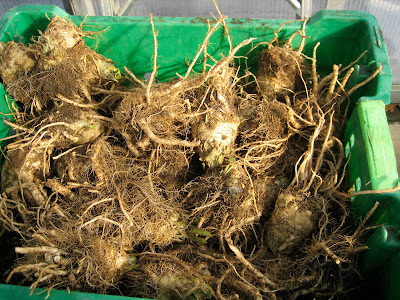 Celery Root, although great tasting, should really be cut and washed before devouring. Matt eventually figured this out after his third or fourth bite. A little too soily, I think was the way he described it. A knife. What a novel idea. 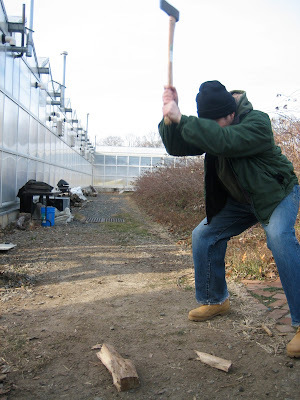 While letting this technique settle in, The Captain took us outside to use a different kind of sharp object, an axe! Yes, us city folk sure do love the chance to chop things. Using a plastic knife during lunch just doesn't seem to cut it. What better way to enjoy the day of washing and cutting vegetables than to "dangle the carrot" of delicious pizzas over our heads. The captain demonstrated some simple wood chopping techniques and also explained the new, more efficient fire style we would be using in the cob oven, which we will get to in a few pictures. Back at the prep station, Matt and I got to cleaning up these funky root vegetables. The goal here is to cut off all the hair (roots) leaving only the big heart shaped center, which can be sauteed, baked or pancaked like a potato (highly recommend pancaking), used in soups or even raw. It's pretty versatile once you cut off all the rough outer parts. Once cut, the celery root was laid out on the washing table to rinse off all of the soil. The hard, brown outer layer protects the celery root from spoiling too quickly, but should be cut off right before you are ready to prepare them, somewhat like a potato. after a few tweaks of course, but look at that beautiful pile of wood. The fire below is how the oven was originally being used, a blazing fire in the middle of the oven. After a few hours, it would be taken down with the coals and ash pushed to the back. Although that worked, The Captain determined that by splitting the fire into two equal parts on both sides, the flames could continue to burn while also making a pathway for pizzas or anything else. This more evenly distributed heat inside the oven, therefore cooking the pizzas more evenly and faster. Just as Evan explained when building the oven, as the fire burns inside the oven, heat flows out of the chimney, hot enough to heat up and enjoy some warm apple cider in this cold fall weather. As the cold settles in and a new group of cold weather veggies comes to market, don't be shy and try something new, something seasonal. Your supermarket probably still has tomatoes, pineapples, bananas and any other fruit and vegetable you can think of that's probably not in season if you're in New York, so why not try out some seasonal celery root, you just might love it too.